In 1895 Lord Strathcona created this beautiful lochan and woodland for his Canadian wife Isabella, who was of Native American descent. 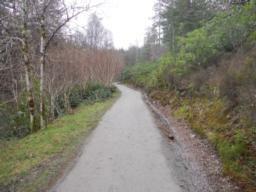 The trail is nestled in the centre of the wood and is surrounded by majestic conifers and rugged mountains. 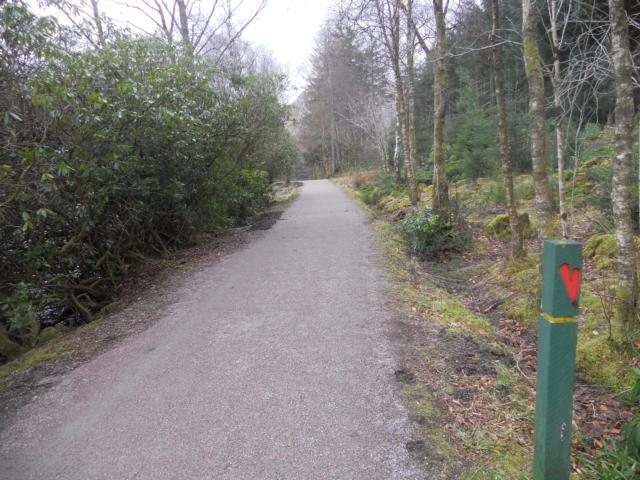 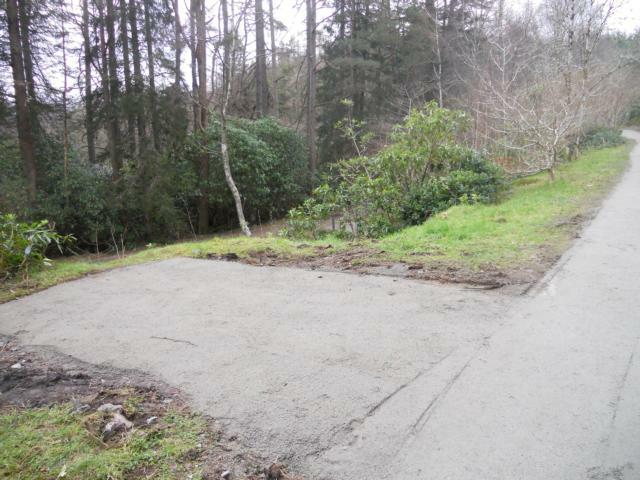 Please note that during the visit, work was underway to improve the path so the pictures don't show a number of benches that should be installed presently. 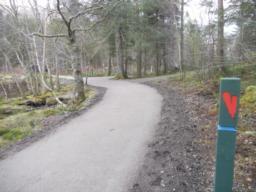 Despite a steady gradient at the start, this trail offers good access, plenty of seating and wonderful views. 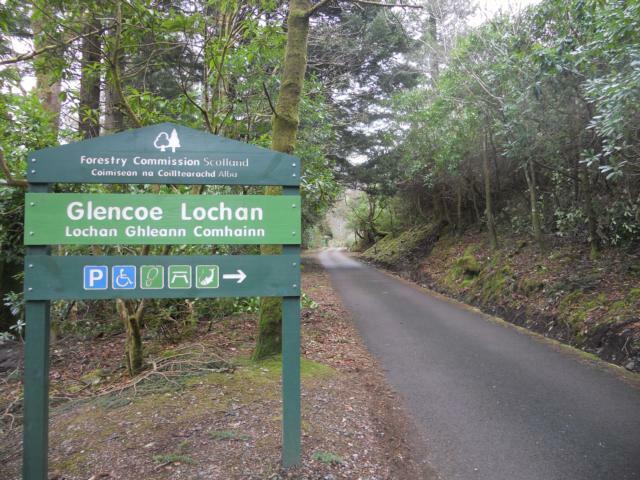 The trail is located just a couple of minutes drive from Glencoe village, making it a great place for a side-trip on a day out. 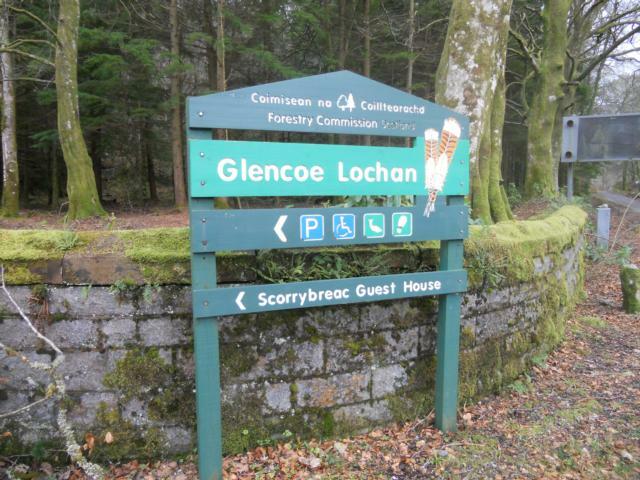 Proceed up the drive and bear right at this sign. 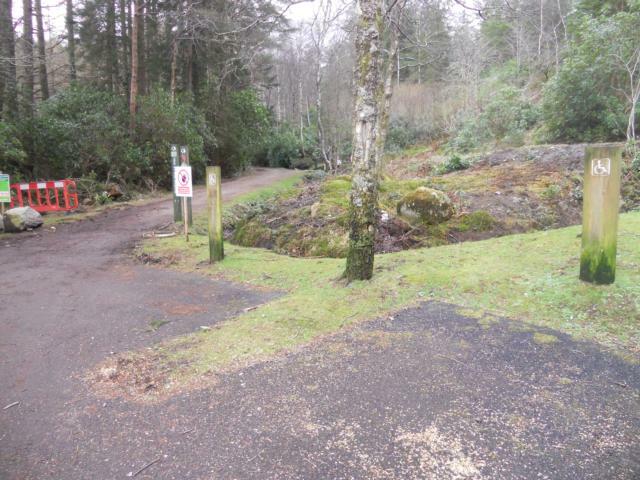 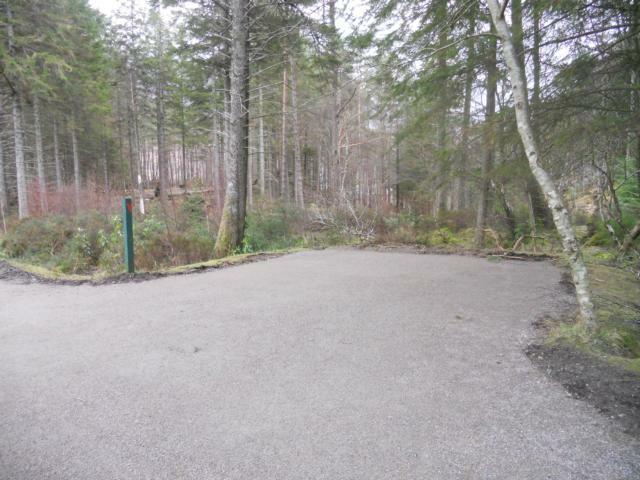 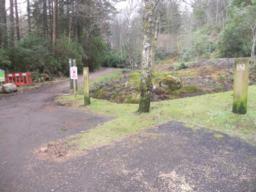 There are three accessible parking areas located at the trail head. 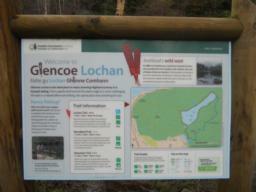 The red dots illustrate the Lochan Trail. 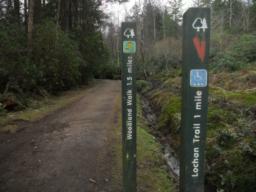 The trail distance is 1mile / 1.6km and the information board suggests allowing 40 mins for the walk. 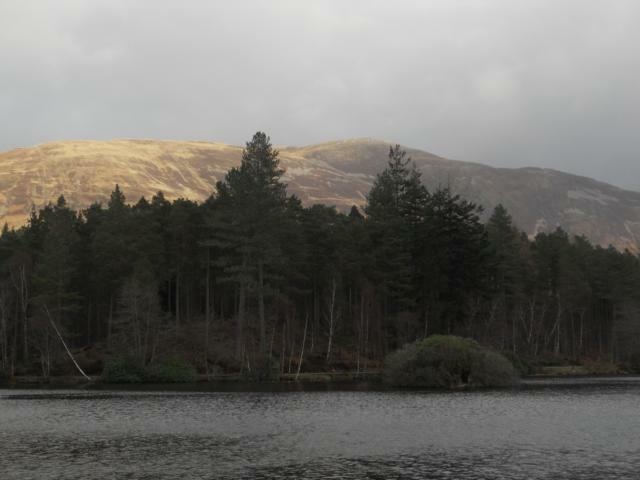 For the Lochan trail, follow the 'red feather'signs. 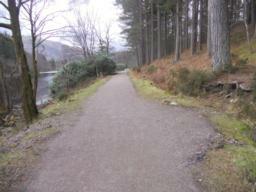 The path is at least 2m in width at the start of the trail. 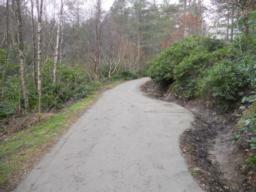 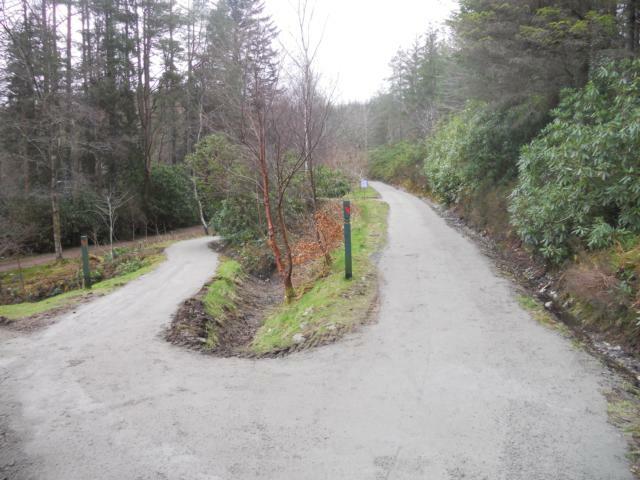 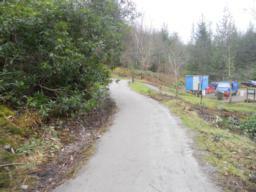 During the visit Contractors were resurfacing the path. 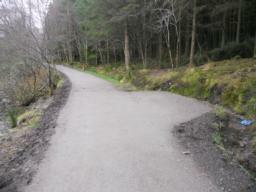 This was being done to a very good standard. The path follows a sustained, yet moderate uphill gradient. 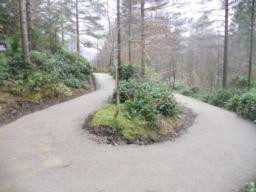 The path zig-zags several times to reduce the uphill gradient. At this point the gradient was 6%. 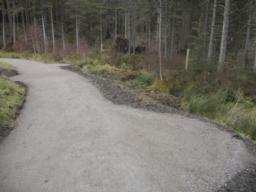 During the visit several rest areas were bein constructed. 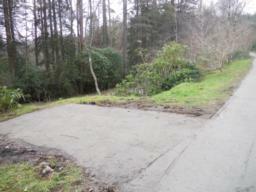 Once finished this area will contain seating. 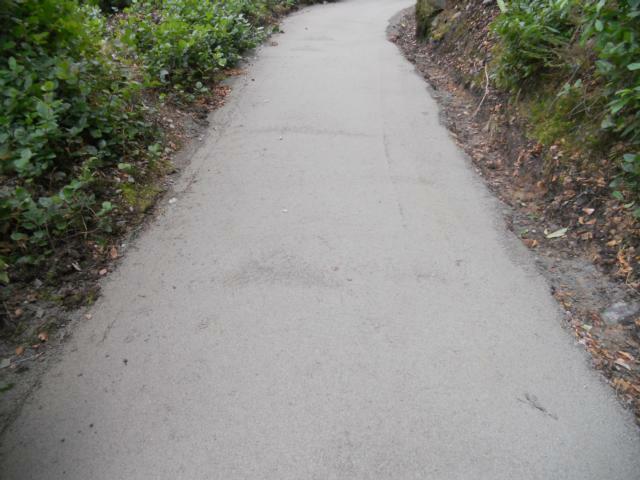 The uphill gradient is sustained and moderately steep. 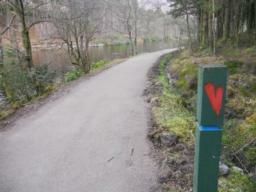 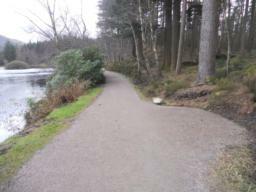 The path has been widened at regular intervals to accomodate benches. 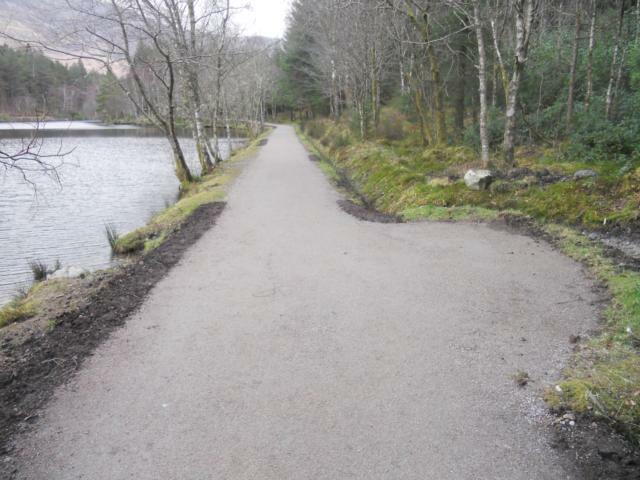 These will be installed after the path improvements have been completed. 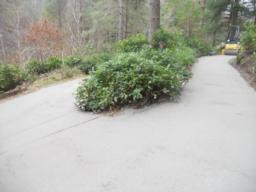 Several switchbacks have been created to reduce the uphill gradient. 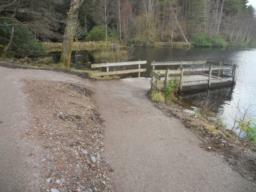 The final switchback up to the Lochan. 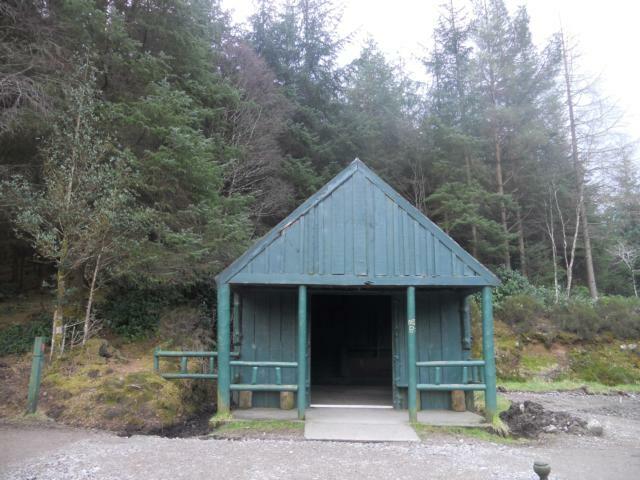 A boathouse and shelter is situated next to the Loch at the top of the hill. A jetty provides disabled access. 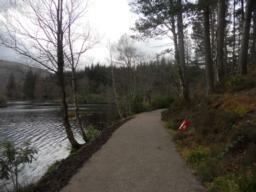 The path hugs the shoreline. 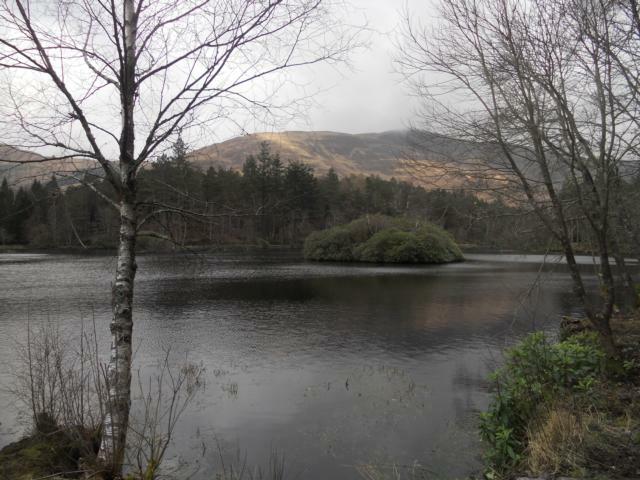 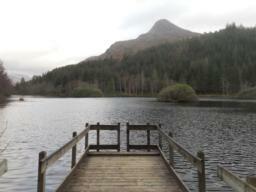 View across the Lochan to the islands. 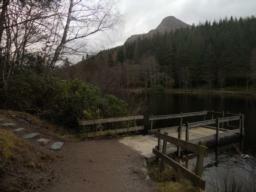 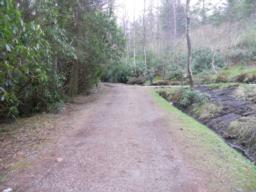 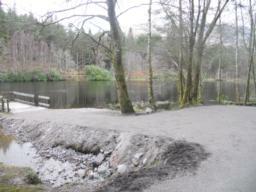 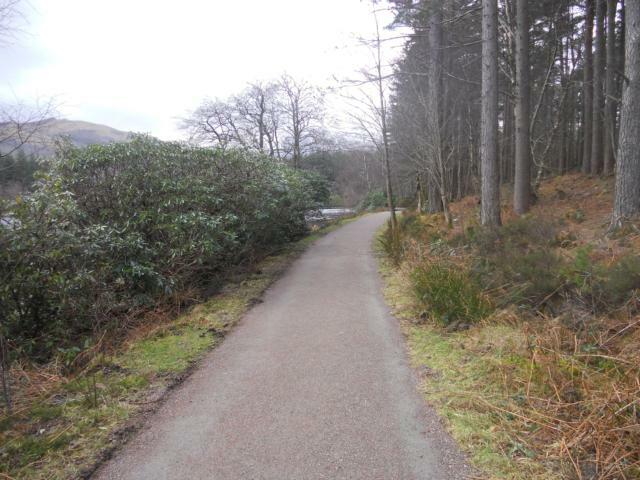 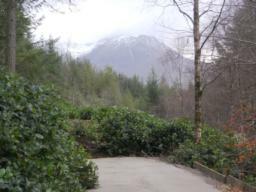 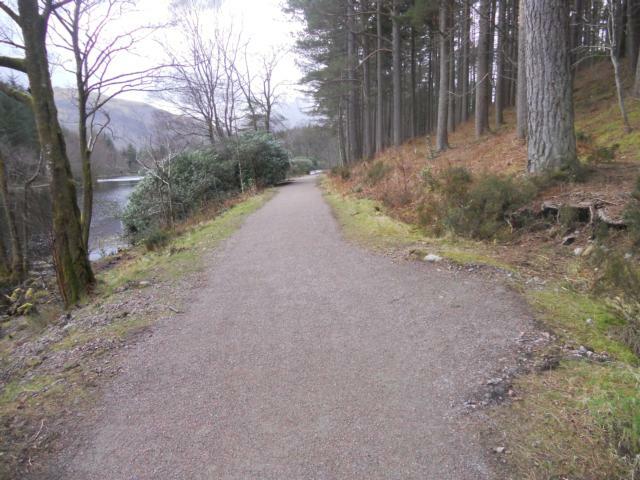 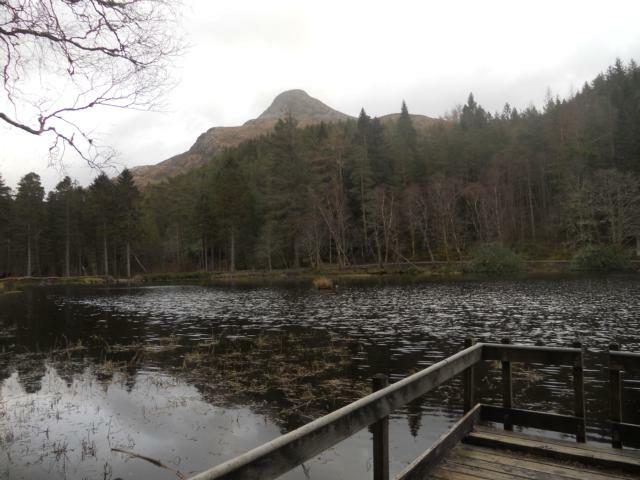 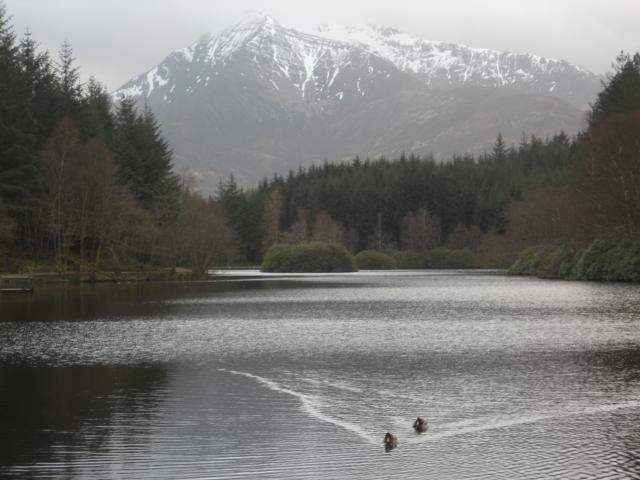 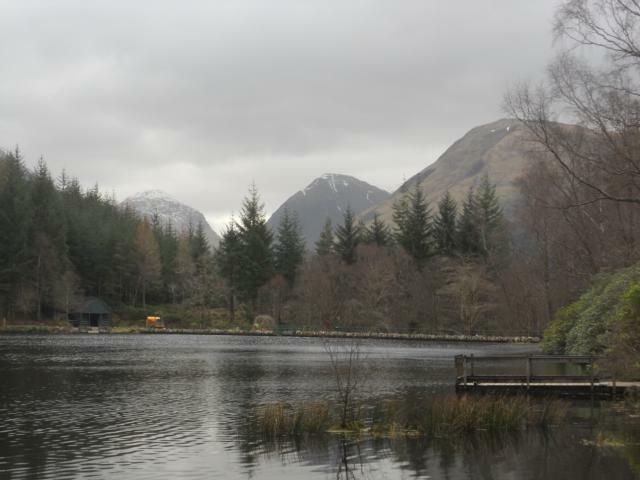 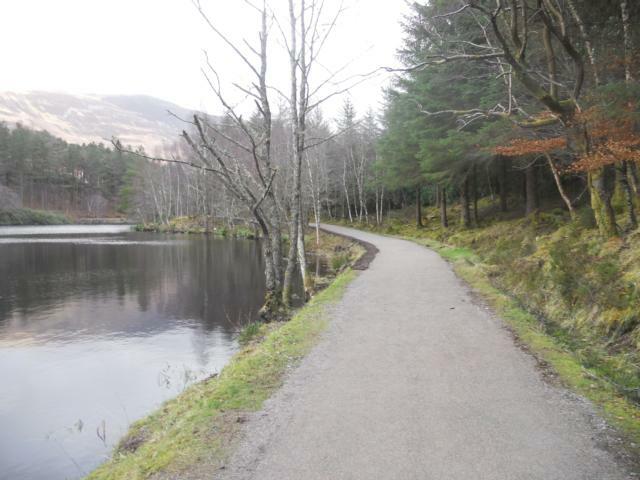 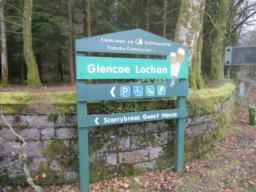 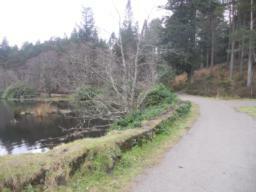 The path is level, wide and well compacted around Glencoe Lochan. 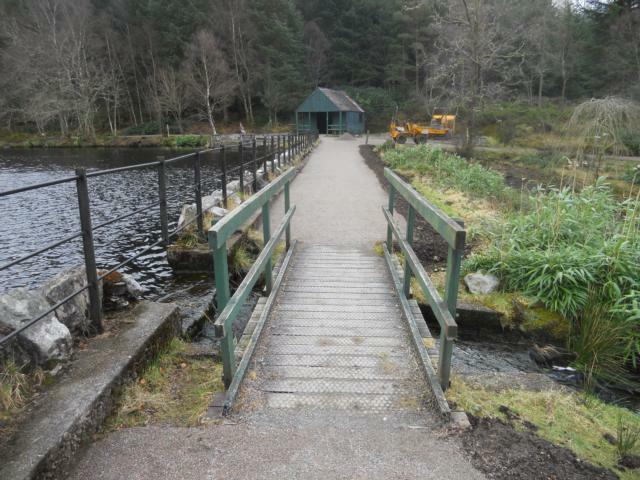 Approach to one of the fishing platforms. 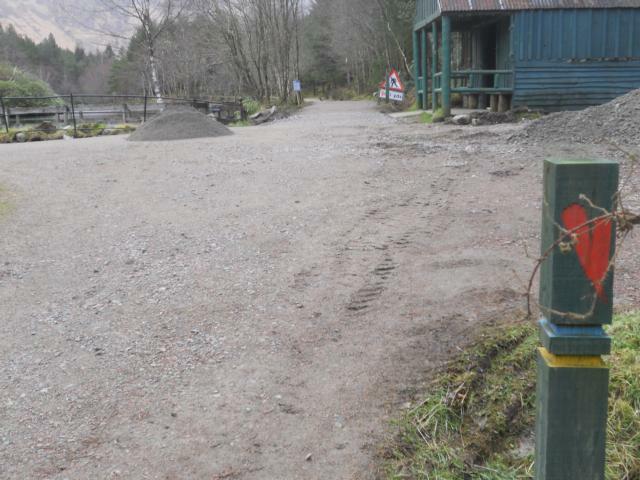 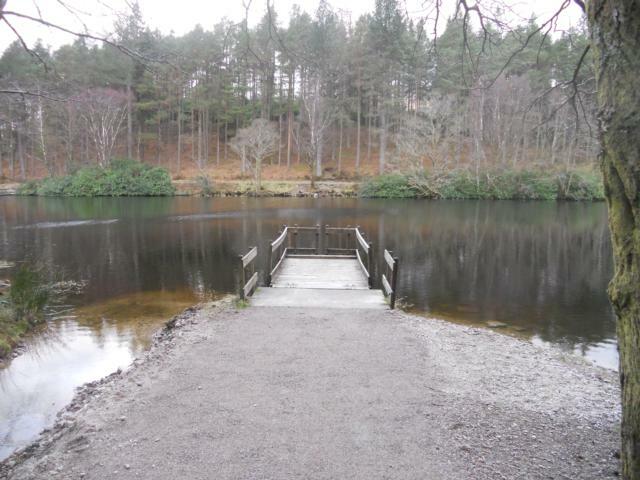 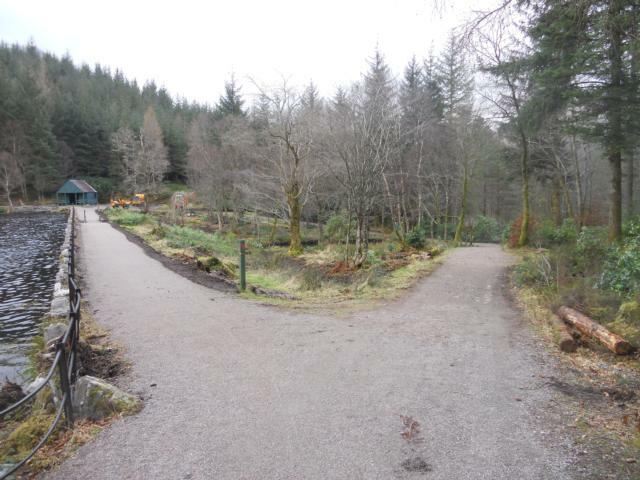 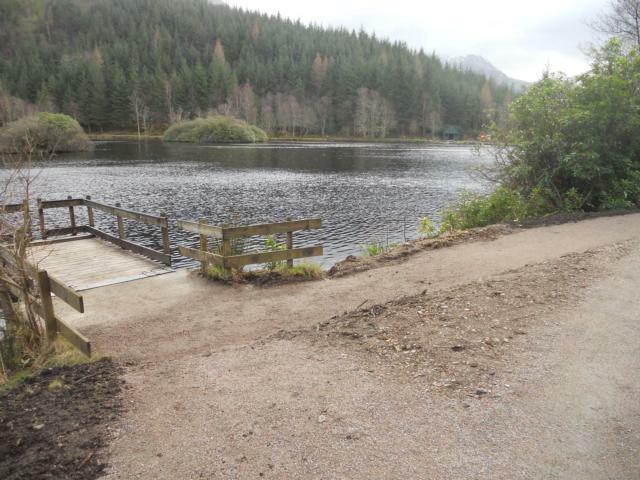 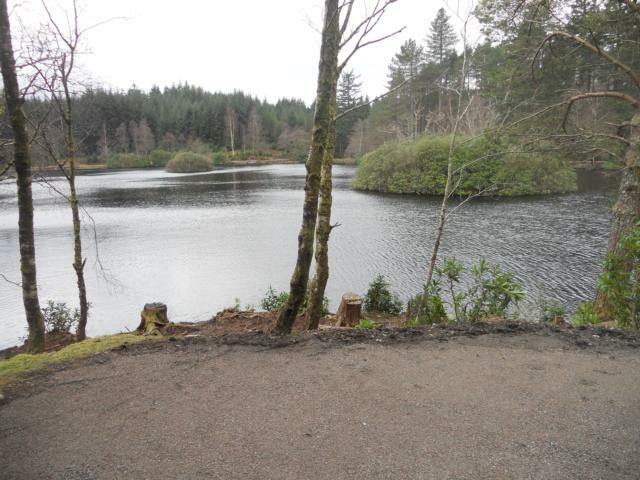 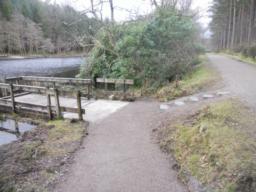 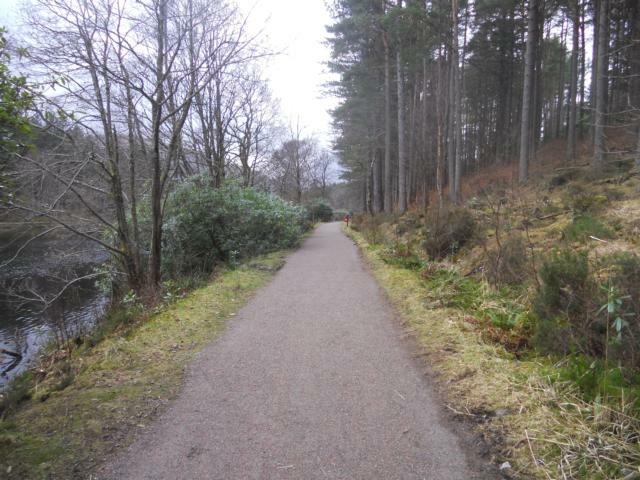 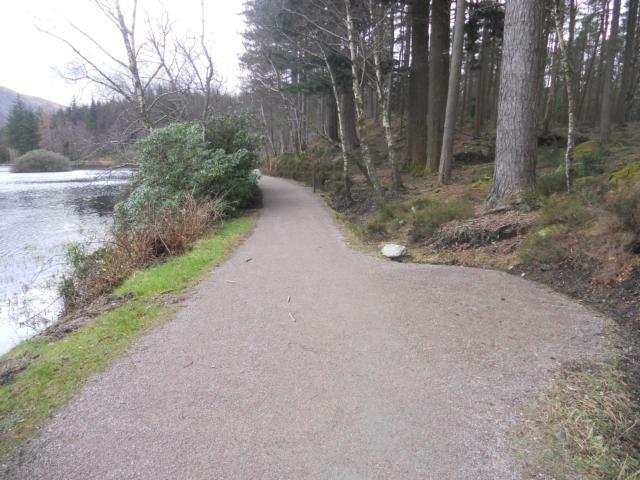 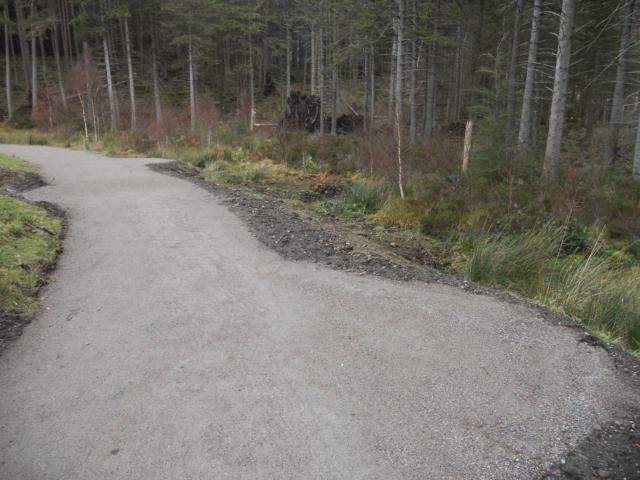 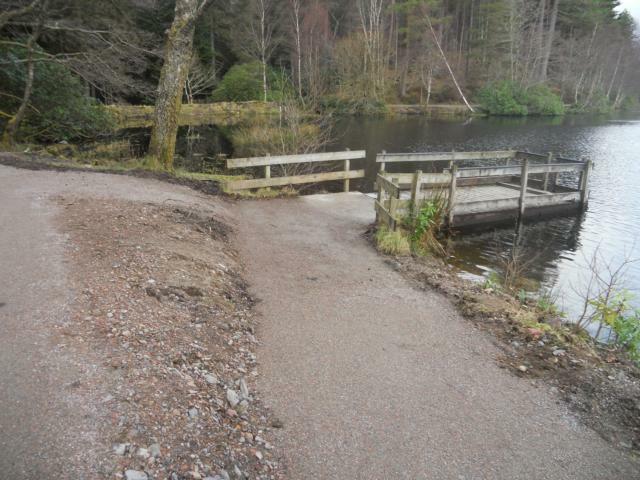 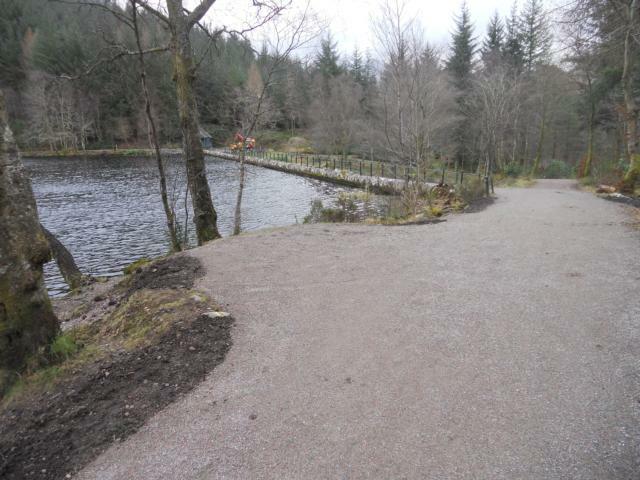 At the far end of the Lochan, the path has been widened to accomodate seating, as will be provided when the path upgrades are completed. 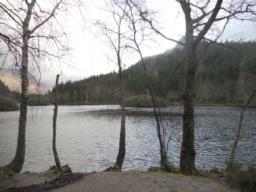 View from the far-end of the Lochan. Some fishing platforms have stepped as well as ramped access. 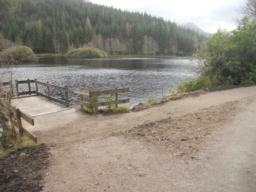 View from the fishing platform. 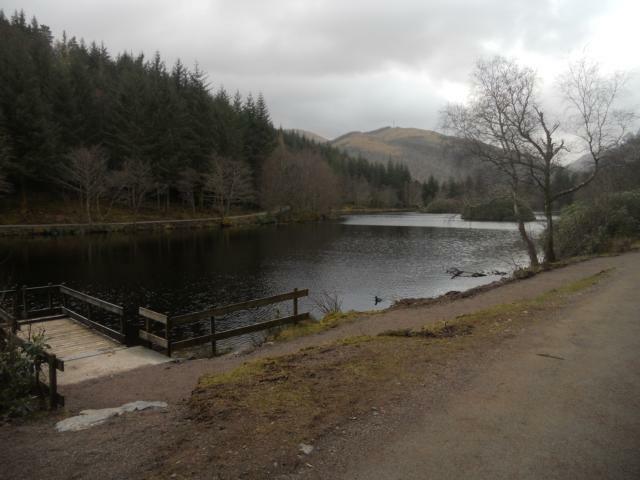 Spendid views, even on a cloudy day! 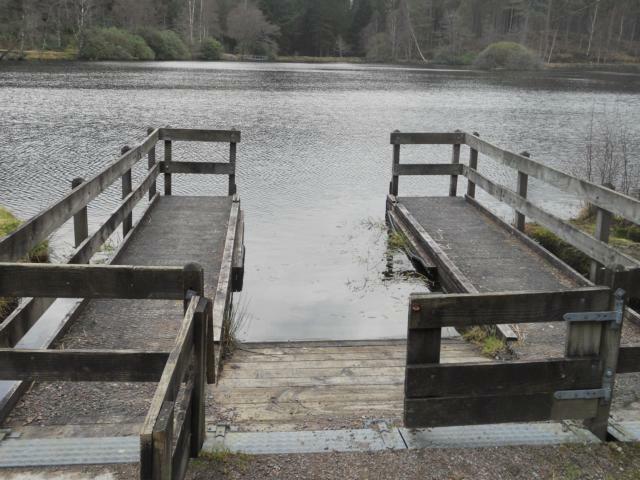 Ramped access is provided to all the fishing platforms. 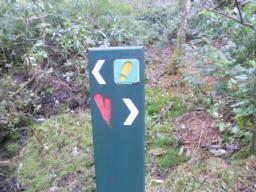 Either direction can be taken here, but the left hand fork follows the shorter and less steep route. 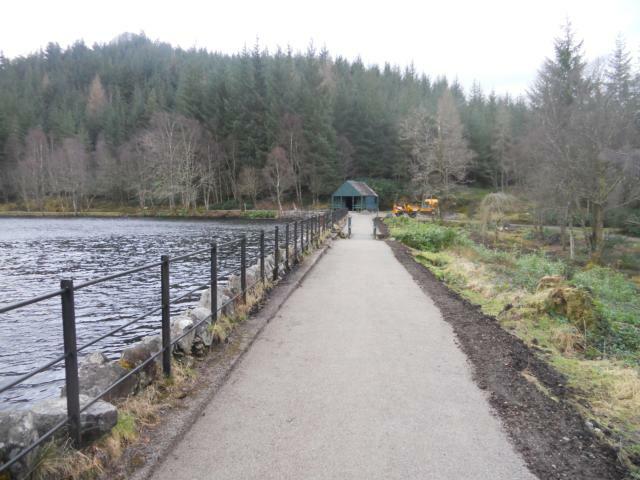 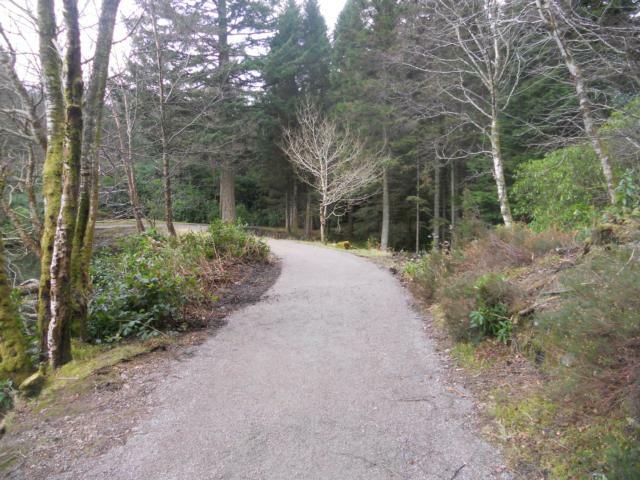 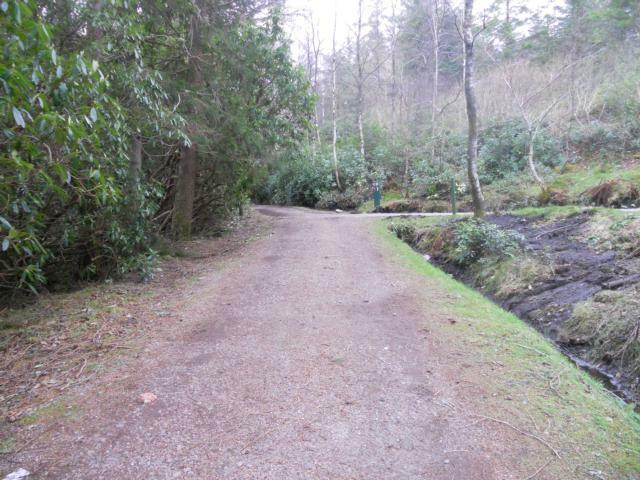 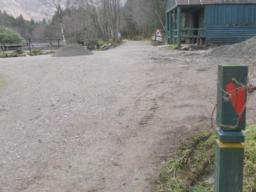 Continue towards the boat house then turn right to retrace your steps down to the car park. A short section of boardwalk creates a narrowing of the path at the end of the trail. It is unlikely that this will create a barrier for wheelchair users.